(CNN) -- Americans are spending less time stuck in traffic and wasting less gas, according to a new report. 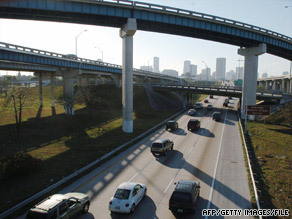 The Texas Transportation Institute reports commute times saw a small dip in 2007. Rising joblessness and stinging gas prices have put the brakes on worsening trends in traffic congestion, according to a study issued Wednesday by the Texas Transportation Institute, the nation's largest university-based transportation research facility. "It's temporary, but real," said institute spokesman Bernie Fette about the declines. "As goes the American economy, so goes traffic. There's fewer people going to work." The institute attributed the changes to the recession, but the U.S. economy did not begin to slow significantly until the end of 2007. The organization began tracking traffic trends in 1982, and by "every measure, congestion has increased substantially" in those 25 years, the latest Urban Mobility Report said. Not in 2007. Researchers surveyed 439 urban centers in the United States and found that travelers spent one hour less stuck in traffic in 2007 than they did in 2006 and wasted 1 gallon less of gasoline. Congestion delay per traveler in 1982 was 13.8 hours. In 2005, that number had almost tripled to 37.4 hours. But it was down to 36.1 hours in 2007, representing a "rare break in near-constant growth," the report said. Because the changes were nominal, some people may not have noticed any change in their commutes. The average person still needs 25 percent more time to travel during rush hour than during other parts of the day, Fette said. "Things were so congested and bad, it was kind of hard to notice," Fette said. • American travelers still wasted 4.2 billion hours stuck in rush-hour traffic jams. That amounts to nearly one full work (or vacation) week for every traveler. • The overall cost, based on wasted fuel and lost productivity, reached $87.3 billion in 2007, the report said. That's more than $750 per person. • The amount of wasted fuel from sitting idle with the motor running topped 2.8 billion gallons or three weeks' worth of gas for every traveler. Congestion has slowed but, said the report's authors, that means only that things are getting worse slower, "hardly a positive goal statement." The Urban Mobility Report data base includes a few similar periods from regional recessions in the past -- Northeastern states in the early 1980s, Texas in the mid-1980s, California in the early 1990s. In every case, when the economy rebounded, so did the congestion problem, the report said. That means congestion trends are likely to swing upward once the economy starts picking up. Americans might then have fatter pocketbooks, but they'll go back to staring through their windshields a bit longer.